Last Friday (6/17), Rebecca invited me along on an all-day search for butterflies on the road up to the Santa Fe Ski Area and on to Los Alamos and its Pajarito Ski Area and Camp May; the latter highlighted in Cary’s “Butterfly Landscapes of New Mexico.” The road up the mountain to the Santa Fe Ski Area was very green and full of wildflowers, with considerably more moisture than we’ve been seeing around Albuquerque. 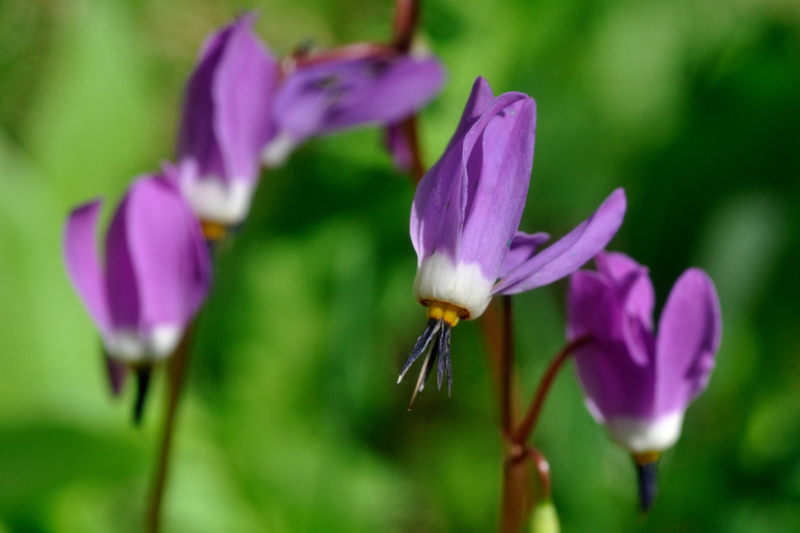 Among the wildflowers blooming that day were the Shooting Stars I remember from spring trips to Colorado. 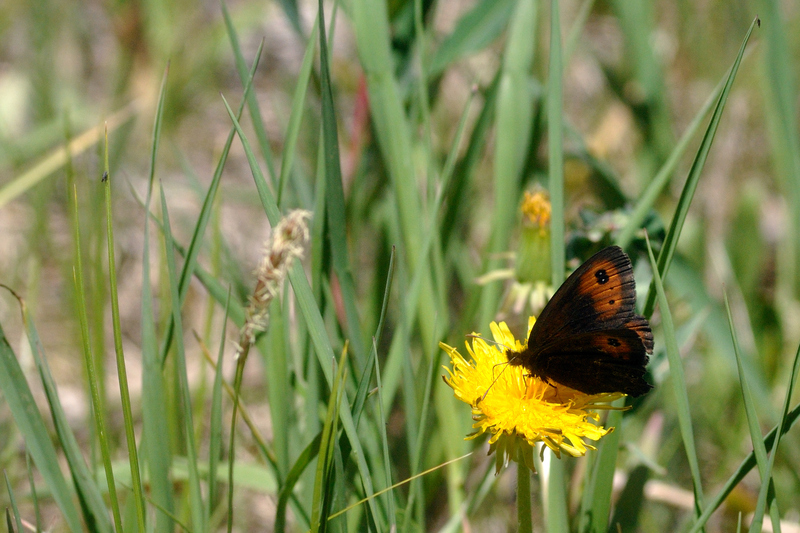 In the meadow at the Ski Area were large numbers of Greenish Blues. 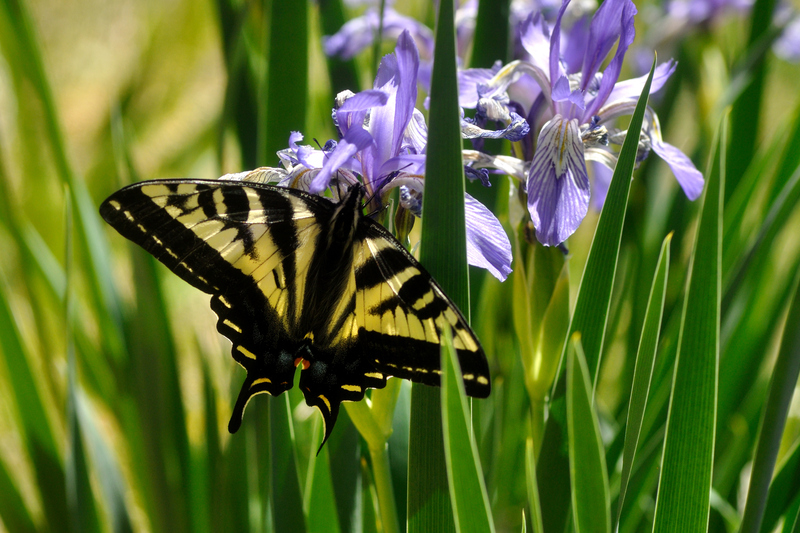 We’d also been seeing quite a few Western Tiger Swallowtails all the way up the mountain, but in the meadow we’d see several clustered around the blooming iris. 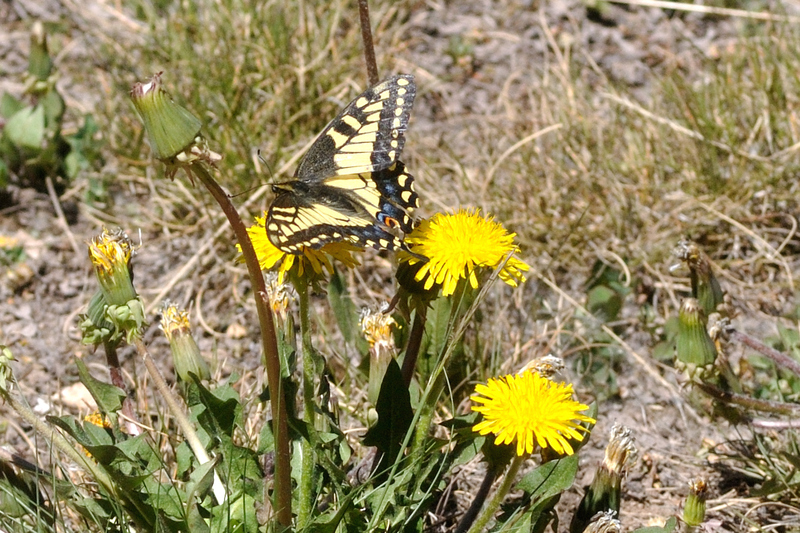 And, finally, we got good looks at an Anise Swallowtail, which we’d seen last week on Sandia Crest, but those guys never stopped long enough for a picture like they did on this trip. Although those Greenish Blues, and later at Pajarito, the Boisduval’s Skippers and Queen Alexandra’s Sulphur also were brand new butterflies for me, my ‘butterfly of the day’ was the Common Alpine of which we saw several individuals in the more grassy meadows across the road from the Ski Area. and the usual Field Crescent. 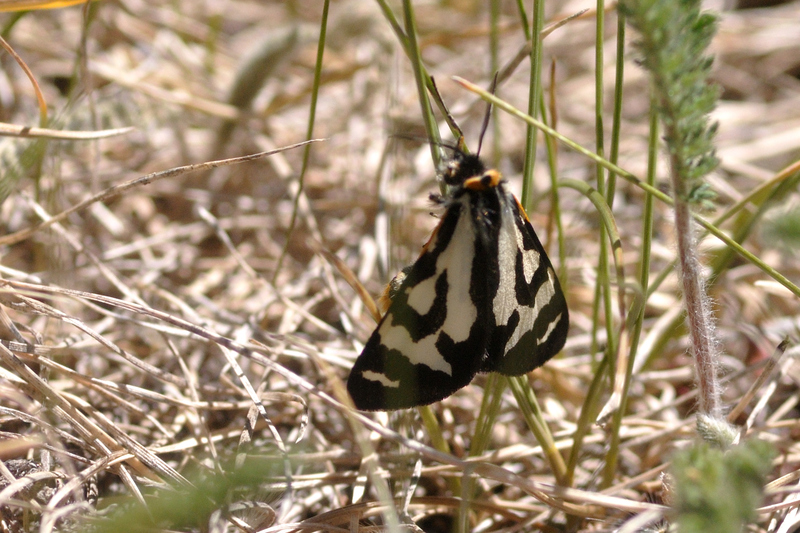 Another interesting sighting there was a Wood Tiger Moth (Parasemia plantginis – thanks, Rebecca, for figuring out what it was), our second interesting moth after seeing a White-lined Sphinx Moth on one of our stops heading up to the Santa Fe Ski Area. 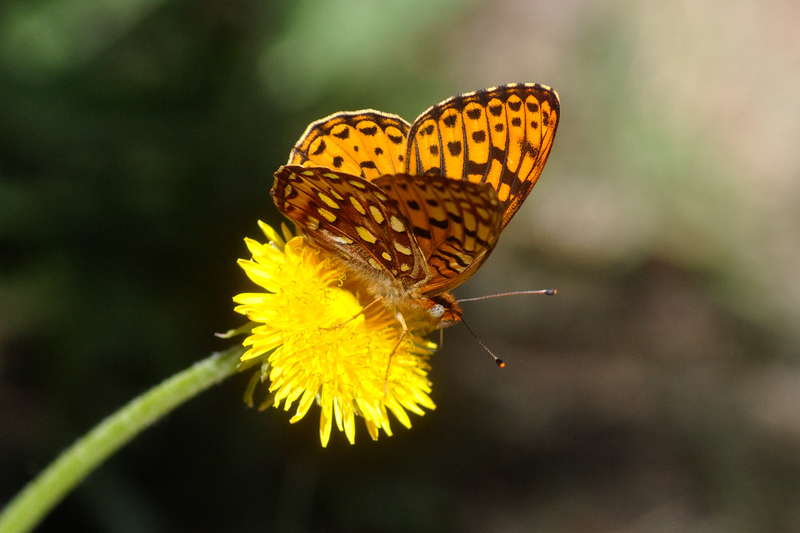 By the time we got to Pajarito, the wind had picked up a bit, but we got lucky at spotting a few new butterflies, such as that Boisduval’s Skipper and Queen Alexandra’s Sulphur. 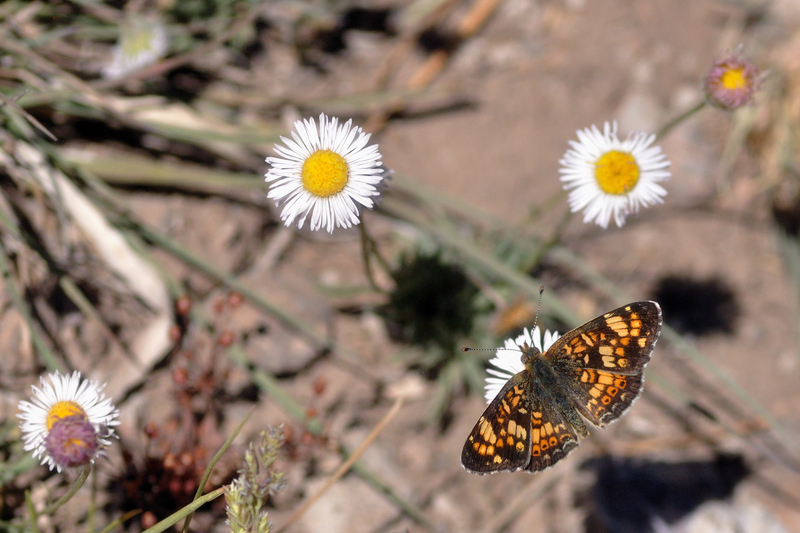 We wrapped up the day with another stop at Burnt Mesa, which has been good for butterflies in the past, but that day, although the vegetation was greener than on our previous visit, it was very windy, hot and dry, and other than a couple of Northern Flickers, we didn’t see anything moving. If it ever rains, we’ll certainly have to go back and try again. This entry was posted in Butterfly, Flowers. Bookmark the permalink. We had a great day of butterflies and your pictures capture the beauty of the most spectacular of them.